Buzz Lightyear of Star Command: The Adventure Begins is a 2000 American direct-to-video animated action comedy-adventure film that acts as a pilot to the television series Buzz Lightyear of Star Command. Buzz Lightyear (Tim Allen) and Warp Darkmatter (Diedrich Bader) are searching for three missing Little Green Men (L.G.M.) (Patrick Warburton), a noosphere-dwelling race serving as Star Command's Universe Protection Unit's scientists. They discover the lost L.G.M. in a hidden outpost belonging to Evil Emperor Zurg (Wayne Knight). Buzz and Warp break in and rescue the L.G.M., and a battle breaks out with Zurg's robots while they escape. Zurg triggers the self-destruct mechanism; Warp gets pinned under wreckage and forces Buzz to leave just before the explosion happens, presumably killing Warp. Blaming himself for Warp's death, Buzz refuses a new partner, but is given a Star Command recruit, Princess Mira Nova (Nicole Sullivan), whom Commander Nebula (Adam Carolla) trains. With the power of "ghosting", Nova is nearly invulnerable. Buzz reiterates his refusal to endanger another partner, despite Nebula's forceful assertion that Buzz must not work alone. Buzz later rescues a shy janitor named Booster (Stephen Furst) from being fired. In Zurg's fortress, his new second-in-command, Agent Z, is given a robotic arm that becomes a variety of weapons. Zurg learns of a huge orb on the L.G.M. homeworld called the Uni-Mind, responsible for the telepathic link between them; he sends his robots to capture it. The L.G.M. build a robot soldier called XR (Larry Miller), who is offered to Buzz as a partner as he can be repaired after any damage and can learn from him. They get a telepathic message about Zurg's attack. When Buzz and XR arrive on the L.G.M. planet, they are confronted by Agent Z, who destroys XR while the Uni-Mind is stolen by Zurg. Unable to think clearly, the L.G.M. rebuild XR, but with a mind of his own. Commander Nebula decides to launch a full-scale assault on Planet Z, but Mira says a solo ranger could go to stop Zurg with the prototype Alpha-One. Nebula dismisses the idea, deciding to launch the full-scale assault. Zurg corrupts the Uni-Mind, so he can use it to control minds, while his scientists start making a "Mega-Ray" to use the corrupted Uni-Mind to bend entire populations of people to Zurg's will. Mira steals the Alpha-One prototype spacecraft to fight Zurg. Buzz pursues Mira in his own craft, not realizing Booster and XR are inside it, having entered it to play make-believe. Eventually, Buzz catches Mira and stores Alpha-One in his spaceship's cargo bay; Booster and XR are discovered also. Zurg's Mega-Ray subverts several planets in quick succession before turning it on Star Command. Buzz, Mira, Booster, and XR discover all of the staff have been suborned by Zurg; they flee in Buzz's Star Cruiser. Zurg uses Star Command's entire arsenal, planting a bomb on Buzz's ship. Buzz and the others escape in the Alpha-One just before the bomb detonates, destroying the cruiser. Zurg presumes Buzz dead. Booster accidentally causes the ship to crash-land on Planet Z. There, Buzz insists on finishing the mission alone and orders the others to leave. Buzz fights Agent Z, but he is shocked when Agent Z removes his helmet, revealing himself as Warp Darkmatter. Taking advantage of Buzz's momentary confusion, Warp knocks him out and delivers him to Zurg. Warp explains that he faked his death at the beginning of the film and was secretly working for Zurg for years as a double agent. When Zurg mocks Buzz, Buzz responds by dictating his "final log entry". Zurg and Warp watch in amusement, but Mira, Booster and XR hear Buzz's surrender and his final entry (which includes a coded plea for help). Zurg plans to use the Mega-Ray on Buzz, but XR and Booster arrive in time to rescue him as it fires. Booster and Mira destroy Warp's mechanical arm after Booster lands on him. Buzz and Zurg face each other; Zurg thinks he has won, but Buzz and his three friends surround Zurg and pronounce him under arrest. Zurg escapes through a distraction. Booster and XR capture Warp and leap from Zurg's now-exploding tower. Mira uses her "ghosting" power to take Buzz to the core of the Uni-Mind and restore it to normal, freeing the suborned peoples and leaving Zurg momentarily helpless. The unity of the L.G.M. is restored and Warp is arrested. 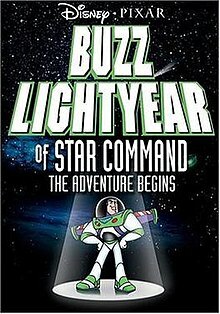 Buzz, having at last admitted that he cannot work alone, creates a new team called "Team Lightyear" with XR, Mira and Booster (all newly decorated with Star Command's highest commendation). They fly to the galaxy and shout "To infinity and beyond!" Set in the fictional universe of the Disney/Pixar film series Toy Story, the film inspired a line of Buzz Lightyear toys. The opening computer-animated sequence was created by Pixar, while the rest of the film was traditionally animated by Walt Disney Animation Japan, Walt Disney Television Animation and Walt Disney Video Premiere. It was the only film spin-off of a Pixar film until 2013's theatrical Cars spin-off film Planes. Tim Allen reprises his role as the voice of Buzz Lightyear, as do Wallace Shawn, R. Lee Ermey, Jeff Pidgeon, and Joe Ranft as Rex, Sarge, Squeeze Toy Aliens and Wheezy respectively. Woody is voiced by Jim Hanks, the younger brother of his original voice actor Tom Hanks (as Tom was too busy working on Cast Away), and Hamm is voiced by Andrew Stanton instead of John Ratzenberger. Originally, Patrick Warburton, (the TV series voice for Buzz), voiced Buzz for the film, but when it was released to video, his lines were redubbed by Allen. Slinky Dog makes a silent cameo due to Jim Varney's death on February 10, 2000. When the movie was later edited into three episodes of the television show, the opening "Andy's Room" sequence was removed and Warburton's vocal performance replaced Allen's. ^ a b c d e f g h Stack, Peter (August 13, 2000). "Buzz Lightyear Tops Stack of Kid Stuff". San Francisco Chronicle. Retrieved March 25, 2011. ^ Fretts, Bruce (August 8, 2000). "Buzz Lightyear of Star Command Review". Entertainment Weekly. Retrieved January 19, 2014. ^ "Video Business Video Premiere Award winners". Variety. February 25, 2011. Retrieved January 18, 2014. This page was last edited on 14 April 2019, at 16:10 (UTC).